To identify the tree species of Kenan Woods and estimate relative health. Based on the species composition and performance, develop strategic recommendations for care of existing trees and project recommendations for future planting. Each tree was identified as true-to-species as feasible. Many trees had long slender boles (trunks), small crowns, and were 50 to 70’ high. Condition of trees was based on density of foliage (crown), presence of dead limbs, and trunk injury. Each tree was afforded a “low”, “moderate”, or “high” rating. For example, many of the pines are geriatric with sparsely needled crowns and many dead limbs. Crowns are small in relation to tree height (60 to 70’) as the needles were subjected to excess shade from the competing deciduous, broadleaf trees. The number of dead limbs in the pines should be cause for concern, especially during football weekends. Most pines, therefore, were rated “low”. The general floristic health of each area was determined by diversity of species, woody and herbaceous, and condition of trees. Seedling regeneration is an indication of minimal human traffic, organic-rich, deep, moisture-retentive soils, and reproductive overstory trees. Areas such as A1 – A6 (NE Kenan Woods) were devoid of any seedling regeneration. Table 1 lists the species, number, and condition. There were approximately 1296 trees accessioned with only 126 (9.7%) rated “high”; conversely 839 (64.6%) rated “low”. Carya species, particularly C. tomentosa, along with Quercus alba, constituted the majority of the “highs”. Thirty (29%) of C. tomentosa rated “high”; 20 (12.7%) of all Q. alba. Only 9 of 215 (4.2%) Pinus species rated “high”. The pines are definitely on the senescent side of their useful life. Acer rubrum, Carya glabra, Carya tomentosa, Cornus florida, Liquidambar styraciflua, Nyssa sylvatica, Oxydendrum arboreum, Pinus echinata, Pinus taeda, Prunus serotina, Quercus alba, and Quercus stellata were 82% (1065) of the total tree matrix. Removing Oxydendrum arboreum and Cornus florida, both understory species with none in the “high” category, reduces the percentage to 67.8% (816 trees). Approximately 49 species, plus a few unknowns, comprised the total Kenan Woods. There were several invasive species, Morus alba, Paulownia tomentosa, Prunus ×yeodensis, but in minimal quantities of 3, 7, and 7, respectively. Native species are the greatest contributors to Kenan Woods. Depending on the area (see Table 1), natives should be the principal species of choice and necessity, particularly Acer, Carya and Quercus taxa. The Pinus species are at the end of their useful life. Replanting pines is acceptable but full sun areas should be designated. The understory trees, particularly Cornus florida, are suffering. Not a single dogwood achieved “high”. Dogwoods contribute magnificent flowers in April and fall color in October – November. Ideally, add more in the Kenan Woods areas that are less trafficked. A recommended list of native trees for Kenan Woods appears in Tables 6 and 7. Tables 2 – 5 reflect Northeast, Northwest, Southwest and Southeast areas around the stadium. Northeast is designated by A1 – A7 on the map, Northwest by B1 – B19, Southwest by C1 – C15 and Southeast by D1 – D16, respectively. Evaluation of each section follows. Tree numbers state the obvious…only 8.9% “high” condition (of 224 trees). Woods were thin, canopies more open, trees not large in height/trunk diameter. Essentially no regeneration due to foot traffic and soil conditions. Remarkably, white oaks, Quercus alba, were superior to other taxa. Some new planting of pines and white and willow oaks had occurred. The newly planted trees were in reasonable condition. The Northeast Quadrant is the most obvious area for immediate and sustained tree planting. This is the largest area surveyed and houses the most trees (644), approximately half of the total. Jim Urban’s soil analysis indicated deeper profiles than the rockladen Northeast Quadrant. Eleven percent of the trees were in “high” condition with the deep rooted Carya spp. contributing 36.6% of the “highs”. Species diversity was greater and combined with improved soils and less-trafficked areas produced 38% “high” to “moderate” condition trees compared to 29% “high” to “moderate” condition trees in the Northeast Quadrant. Also, in the B17 to B19 areas, seedling regeneration was high, particularly on the slope above the NC Hall of Fame Plaza. Only one undisturbed area, now fenced for the Genomics Building construction, designated as C1 and C2 on the map, showed significant regeneration. All other areas were highly managed with pine straw mulch and subjected to considerable foot traffic. White oak, Quercus alba, constituted 23% (32 of 138) of the total trees. Most were in “low” to “moderate” condition. Only eight Carya taxa were present with five (58%) “moderate” to “high”. The Southwest Quadrant was obviously in a state of flux with construction and it would be noble to save the best trees which number only 10 or 7.3% of the total. The assessments were concentrated along the walks and heavily trafficked areas. The areas, D1 – D16, are marked on the map. The trees in areas D1 – D6 (D7) are suffering from traffic (human) and runoff from the adjacent parking lot. Oaks represented 34% of the total trees with most (94%) in “low” to “moderate” condition. Seedling regeneration and a rich understory occurred in the D8 to D16 sections that followed the sloping path to the east side of the stadium. Carya glabra and C. tomentosa were again some of the best trees with 54% rated “moderate” to “high”. The Carya and Quercus species are considered climax species, i.e., the end point of succession. They are more shade-tolerant, have deeper root systems, and possibly more effectively compete for water and nutrients. The data show conclusively that without hickories and oaks, Kenan Woods would be the poorer. In fact, 33% of Kenan Woods is represented by Carya and Quercus species. In trafficked areas like A1 – A6 (A7), plant larger trees (3” or greater) and/or protect newly planted areas until established. Utilize signage to encourage people to respect newly planted areas. “The Regreening of Kenan Woods…Please Respect the New Tree Plantings”. To reestablish pines, open, sun-laden areas will be necessary. New Pinus taeda, Loblolly Pine, have been successfully installed in the Northeast Quadrant. The overstory, climax trees are the heartbeats of Kenan Woods. The majority of visitors to Kenan Woods have no idea whether they are beneath maple, hickory, oak, tupelo, or tuliptree. They appreciate and sense the beauty and expect the same, year-in: year-out. To foster this arboricultural legacy, sustained, energetic tree planting must be embraced. Ideally, develop 5- to 10(20)-year replanting strategies based on how many trees are lost each year, poorest areas (Asections), and need to gradually replace geriatric trees. Maintain, possibly increase, species diversity with Acer, Carya, Fagus, Ilex, Liriodenron, Nyssa, and Quercus. In specific genera, like Nyssa, the utilization of the many new, superior fall-coloring selections is a worthy consideration. The understory trees provide great flowers and fall color with Cornus florida currently 14% of the total trees recorded. Future plantings should include the anthracnose- and mildew-resistant cultivars from the Appalachian Series from the University of Tennessee. Other small understory trees are included on the list (see Table 7). In the Northwest and Southeast areas, where foot traffic is less intense, groupings/masses of native viburnums and other native shrubs would enrich the understory, provide flowers, fruit and fall color, and stabilize the soil. 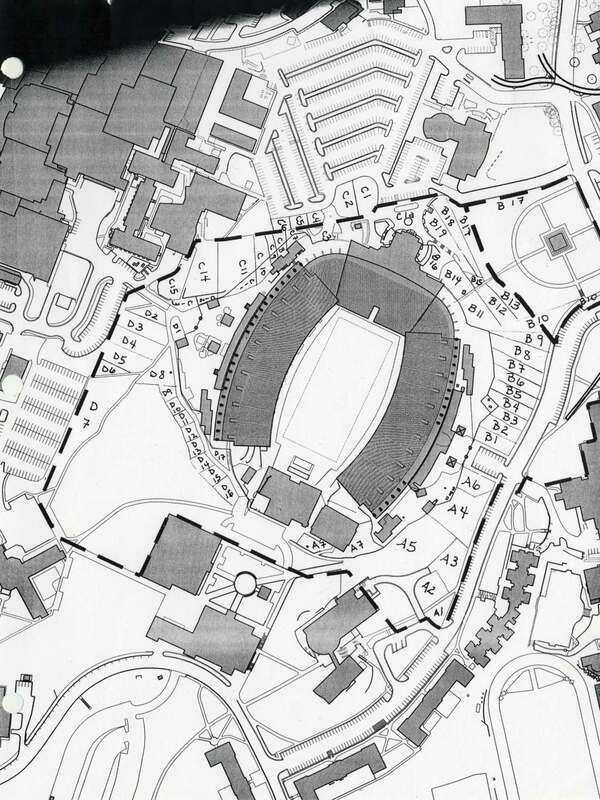 Six viburnums are native in a five-mile radius of the stadium including V. acerifolium (in Kenan Woods), V. dentatum, V. nudum, V. prunifolium, V. rufidulum and V. rafinesquianum (in Kenan Woods). All are shade-tolerant, adaptable, and would enrich the woods. This assessment provides a framework for future planting and maintenance of Kenan Woods. Kenan Woods did not reach this current state in a small window of time, nor will it dissipate quickly. By thoughtful replanting and maintenance, the basic character will be perpetuated and enhanced. NE A1 – A7 Entire NE section sweeping up from the tutoring building and parking deck to small parking area. NE A1 – A7 Dead limbs/hangers on all of the pines. NE A7 Western-most section abutting the tutoring building. Mixed new plantings and regeneration. Needs junk cleared out. NE A7 Scattered: Juniperus virginiana, Ilex opaca, Cornus florida, Liquidambar styraciflua, Robinia pseudoacacia, Prunus serotina, Acer rubrum, Ilex vomitoria, Parthenocissus quinquefolia, Campsis radicans. NW B1 – B19 Entire NW section sweeping from small parking area around Bell Tower. NW B6 Lots of Ilex opaca and Ilex vomitoria seedlings in this section. NW B6 Thicket of Acer rubrum and Liquidambar styraciflua also Ligustrum sinense. NW B7 Grove of Oxydendrum arboreum, Acer rubrum, Cornus florida, and Prunus serotina all low. NW B8 Thicket of Oxydendrum arboreum, Cornus florida, Liquidambar styraciflua, and Prunus serotina all low. NW B10 Elaeagnus pungens –invasive. NW B17 Understory filled with Elaeagnus pungens, Ligustrum sinense, Ligustrum lucidum, Hedera helix (on ground and in trees), Euonymus fortunei (on ground), Morus alba and Lonicera japonica. NW B18 Along with B19, richest woodlands yet assessed. Lots of small seedlings in the undergrowth–only assessed trees >3″ caliper. Rootsprouts, herbaceous material, and regenerating saplings. NW B18 Abundant: Nyssa sylvatica, Prunus serotina, and Cornus florida. NW B18 Scattered: Parthenocissus quinquefolia, Toxicodendron radicans, Arum arifolium, Euonymus fortunei, Hedera helix, Viburnum rafinesquianum, Acer leucoderme, Magnolia grandiflora, Smilax spp. NW B19 Along with B18, richest woodlands yet assessed. Lots of small seedlings in the undergrowth–only assessed trees >3″ caliper. Rootsprouts, herbaceous material, and regenerating saplings. NW B19 Abundant: Nyssa sylvatica, Prunus serotina. NW B19 Scattered: Toxicodendron radicans, Arum arifolium, Acer leucoderme, Acer rubrum, Cornus florida, Vitis rotundifolia. SW C1a – C15 Section includes SW section of stadium sweeping from a broad patio with Zelkova serrata and Platanus spp. (C1a) east to the South gate. SW C1 – C2 Would like to see C1 and C2 saved. SW C1 Scruffy undergrowth consisting of Rubus spp., Hedera helix, Euonymus fortunei, Liquidambar styraciflua and Prunus serotina. SW C1 Grove of small Hickories (Carya spp.). SW C2 Assorted scruffy understory vegetation and seedlings consisting of abundant Hedera helix, Quercus alba, Liquidambar styraciflua, Lonicera japonica and Pinus taeda. SE D1 – D16 SE Woods sweeps east from the South gate to Tutoring building and parking deck. SE D9 – D16 Sections D9 – D16 are 8 roughly 40′ x 40′ squares that hug the path sloping down the hill along the SE side of the stadium. SE D2 Large thicket of understory brush including: Prunus serotina, Crataegus spp., Nyssa sylvatica and Viburnum rafinesquianum. SE D4 Understory Cercis canadensis, Arum arifolium. SE D6 Abundant in understory: Prunus serotina, Acer rubrum. SE D7 Very rich woodland. Understory shows seedlings of many species and vigorous regeneration. Recommend cleaning out garbage plants and replanting with natives. SE D7 Large trees NOT noted in this section. SE D7 Abundant: Acer rubrum, Quercus alba, Nyssa sylvatica, Viburnum rafinesquianum, Prunus serotina, Vitis roundifolia, Viburnum acerifolium (thickets). SE D7 Scattered: Ilex opaca, Carya spp., Acer saccharum, Smilax spp., Magnolia grandiflora, Ligustrum sinense, Rubus spp., Arum arifolium. SE D7 Invasive: Morus alba (scattered), Elaeagnus umbellata, Toxicodendron radicans. SE D8 Understory not as rich as D7. SE D8 Abundant: Viburnum acerifolium. SE D8 Scattered: Acer rubrum, Nyssa sylvatica, Cornus florida, Prunus serotina. SE D9 Abundant: Vitex rotundifolia, Lonicera japonica, Cornus florida (regenerated) and Toxicodendron radicans. SE D9 Scattered: Parthenocissus quinquefolia, Acer rubrum, Nyssa sylvatica, Prunus serotina, Acer saccharum, Viburnum acerifolium, Viburnum rafinesquianum, Magnolia grandiflora. SE D10 Abundant: Vitex rotundifolia, Lonicera japonica, Cornus florida (regenerated) and Toxicodendron radicans. SE D10 Scattered: Parthenocissus quinquefolia, Acer rubrum, Nyssa sylvatica, Prunus serotina, Acer saccharum, Viburnum acerifolium, Viburnum rafinesquianum, Magnolia grandiflora. SE D11 Abundant: Toxicodendron radicans, Prunus serotina, Ampelopsis brevipedunculata. SE D11 Scattered: Parthenocissus quinquefolia, Viburnum rafinesquianum. SE D12 Abundant: Parthenocissus quinquefolia, Toxicodendron radicans. SE D12 Scattered: Viburnum acerifolium, Viburnum rafinesquianum, Rubus spp., Hedera helix. SE D13 Abundant: Euonymus fortunei, Toxicodendron radicans. SE D13 Scattered: Parthenocissus quinquefolia, Viburnum rafinesquianum, Ligustrum sinense, Elaeagnus pungens, Arum arifolium. SE D14 Abundant: Euonymus fortunei, Toxicodendron radicans. SE D14 Scattered: Parthenocissus quinquefolia, Viburnum rafinesquianum, Ligustrum sinense, Elaeagnus pungens, Arum arifolium (3 large Elaeagnus pungens 10′ x 10′). SE D15 Same as D13 and D14 but sparser vegetative cover. SE D15 Abundant: Euonymus fortunei, Toxicodendron radicans. SE D15 Scattered: Parthenocissus quinquefolia, Viburnum rafinesquianum, Ligustrum sinense, Viburnum rufidulum, Euonoymous americanus, Elaeagnus pungens (including 3 giant ones), Arum arifolium. SE D16 Same as D13 and D14 but sparser vegetative cover. SE D16 Abundant: Euonymus fortunei, Toxicodendron radicans. SE D16 Scattered: Parthenocissus quinquefolia, Viburnum rafinesquianum, Ligustrum sinense, Elaeagnus pungens, Osmanthus heterophyllus, Arum arifolium.